Getting information from Air India is not such an easy assignment. 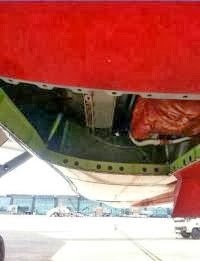 And as I learned from my readers and Jason Rabinowitz of @AirlineFlyer, information on the missing fuselage panel on an Air India Dreamliner reported by Times of India was not correct. Neither Air India's spokesman G.P Rao, nor anyone from the office of air safety have answered my emails seeking details on the Boeing 787 flight which appears to have been made with a unsecured or entirely missing panel. In a post the other day, I suggested that this problem could have been the responsibility of Boeing assembly plant workers in Charleston, South Carolina, where VT-ANO was put together. An insider at the plant told me only using the wrong attachment screws could have allowed the plane to be delivered with the panel intact and then having it fall off in flight, which is how the incident was reported by the Times. The fact that this panel was removed on every one of 89 Boeing 787s to conduct a manufacturer-ordered modification of the environmental control system to correct a problem of condensation and poor drainage led me further to believe the news account that the panel came off a brand new 787. Early Friday morning Rabinowitz sent me a link to a story in First Post, reporting that an Air India mechanic has been suspended for removing the panel and failing to put it back. How a four by eight foot gaping hold was not detected during the pilot walk around prior to the flight is mystifying for me as it is for some of you who have commented on this story. Having already relied on information that the event happened on one plane when it probably occurred on another, I'm giving this report a skeptical eye. It does remind me, however, that not all the facts are known. I will recap the underlying issues. Air India and many other carriers in that country are significantly behind in safety relative to their size and importance in the global economy. Various audits and investigations into safety oversight have been going on for several years. Air India tried and failed to win membership in the Star Alliance, due in part to its inability to meet their standards for safety.Things have hardly improved. Meantime, back at Boeing numerous factory-related problems continue to heckle Dreamliner operators, including Norwegian and LOT Polish, which received two airplanes with missing fuel filters on their engines. Mechanics in Everett forgot to reinstall them after engine testing. I was told that LAN (LATAM Airlines Group), a Dreamliner customer, offered to loan mechanics to Boeing to help the company get airplanes assembled since the company seemed to be having trouble accomplishing it on its own. The Air India missing panel could ultimately be determined to have been an oversight at Boeing or at the airline. My blog should have made this more clear. The publicly available details just aren't conclusive. What this tells me is that when it comes to the Dreamliner, everyone needs to perform better. Including me. Murphy's Law at work: the above comment lauds the wrong airline for offering to help Boeing. For your info, Ma'am, the detached panel was found at the destination airport. Not necessarily much the pilot could've found during the pre departure walkaround.